This line is used to produce PP bags, which can be used to pack salt, sugar fertilizer, chemical etc. And the inside of the bags can be laminated with PE according to customer requirement. Raw material – mix & dry – extruding --- weaving – laminating --- cutting into tubes – sewing --- printing – and piling. This machine is used to dry & mix the raw material, PP, PE etc for the extruder. This machine is used to feed the mixed raw material to the extruder. For a traditional extruding machine, it must change its chain wheel to change its drawing linear speed. However, the chain wheel’s size is fixed, which means one wheel stands for one speed. Users have to prepare different sizes of chain wheel for different speed. This causes low efficiency and high cost. For more, the speed is not accurate when changing by this way. Now our new type extruding machine is adjustable for drawing ratio from 4 to 11, which is controllable and precise via free frequency conversion. It is no more necessary to change any chain wheel when changing its drawing speed. It’s an ideal machine for extruding plastic thread for making container sack, cement sack, chemical sack and so on. The machine can extruder flat thread directly by using 100% recycled material in powder or granular form. Its screw and cylinder are made of 38CrMoAlA alloy after nitriding treatment, the hardness of which is up to HV950 or above. The speed reducer uses hardened helical gear reducer made of 20CrMnTi alloy; the chain wheel is made of 45# quenched medium carbon steel. The drawing roller is electroplated with hard chrome; the drawing system is additionally equipped with tension controllable rewinding shaft; and the feeding drum, three-way pipe and die head adopts aluminum cast heater that’s durable in use. This machine is a power-saving winding machine, which adopts heart-shaped cam. It winds the yarn through the backward and forward movement of swinging rod driven by the heart-shaped cam. 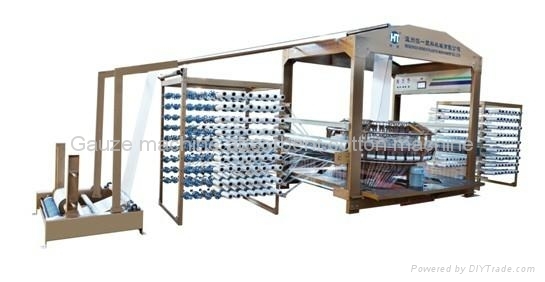 In comparison with reciprocating winding system, the machine is easier and more stable to run. Moreover, its service life is longer as its friction factor of mechanical parts is lower. The bobbin shape looks better after winding. Its main motor reduces 60% power consumption. Bobbin size is Ø38×230. 6. Auto-stop function when yarn breaks or finishes. 8. power-saving, high efficiency, low noise, no oil, run smooth, easy maintenance. 1- capacity: 3000 meters per 24 hours. This machine works to coat a melt cohesive material on the PP fabric, PE fabric, or non-woven fabric, thus achieving the film-coating, laminating with paper, or printed OPP or CPP. It’s high in automation, advanced in technique, easy to operate, energy-saving and high in efficiency. It features double molding heads and double laminating cylinders for getting good quality lamination that’s high in peeling strength, good in whole mechanic property, neat and elegant in look. The machine is equipped with auto edging control and guide device, speed conversion control device, which guarantee convenient operation. It’s applied to producing different-size laminated bag. This machine is used to cut the tubes. 1- capacity: 1000~2000 bags per hour. It’s mainly used for printing woven bag, container bag. Its control system features PLC for optical magnetic positioning, pneumatic pressing and releasing for printing, and auto cutting. It also features frequency convertible speed control system that ensures the smooth operation and saves the energy; and its anilox roller makes the printing ink distribution uniform and full. 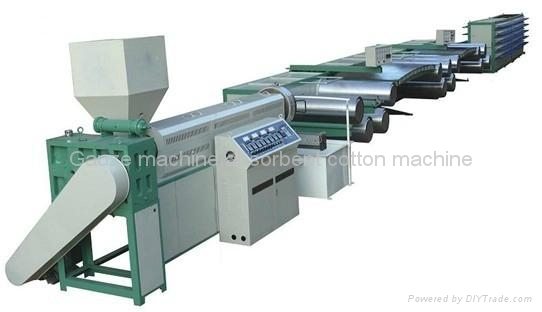 This machine can press the finished woven bags and compounded bags into solid bundles.